SAFFRON -IT STANDS FOR BRAVERY, COURAGE, SACRIFICE, & SELF RESPECT. WHITE- IT STANDS FOR PEACE, TRUTH & POLITENESS. GREEN-IT STANDS FOR VEGETATION & PROSPERITY OF THE NATION. ASOKA CHAKRA-THERE ARE 24 STROKES IN THE ASHOKA CHAKRA.IT DENOTES PROGRESS IN ALL 24 HOURS I.E. EXTERNAL PROGRESS. PURPLE BACKGROUND-PURPLE IS THE INTERNATIONAL COLOUR OF KNIGHTS.IT DENOTING THAT SCOUTING IS THE ROYAL ACTIVITY. 1.THE FLEUR-DE-LEUS IS THE SCOUT EMBLEM .IT IS THE ITALIAN WORD FOR THE FLOWER OF LILY. 2.THE NEEDLE SHOWS NORTHON A MAP.THIS SHOWS TYHE RIGHT DIRECTION TO SCOUTS TOWARDS PROGRESS. 3.THE THREE ENDS AT THE BOTTOM OF THE FLEUR-DE-LEUS REMINDS ABOUT THE PARTS OF TYHE PROMISE..
4.THE RING JOINING THE THREE PETALS FLEUR-DE-LEUS IS SAID TO BE THE RING OF BROTHERHOOD.IT DENOTES BROTHERHOOD AMONG SCOUTS. 5.THE STARS DENOTES THAT SCOUTING IS AS HIGH & AS ESTEEMABLE AS THE STARS AREV SPREAD THROUGHOUT THE SKY, SO IS SCOUTING THROUGHOUT THE WORLD. 6.THE CHORD AROUND THE BADGE WITH REEF KNOT AT THE END DENOTES THAT THE SCOUTS THROUGHOUT THE WORLD ARE TIED IN THE RING OF BROTHERHOOD. THE REEF KNOT REMINDS THE SCOUT TO DO A GOOD TURN DAILY. THE WORLD SCOUT FLAG WAS APPROVED IN 1961 AT THE 18th WORLD CONFERENCE. BLUE IS THE COLOUR OF SKY. THIS INDICATES THAT AS SKY IS SPREAD ALL TROUGH THE EARTH, SO IS SCOUTING. ALSO THAT SOUTING IS TOBOYS WHAT SKY IS TO EARTH. 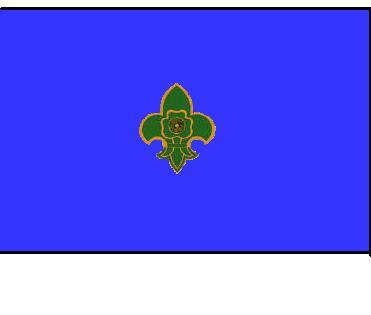 THE FLEUR-DE-LEUS IS THE INTERNATIONAL OF SCOUTS & REPRESENTS SCOUT SECTION. THE SHAMROCK IS THE INTERNATIONAL EMBLEM OF GUIDES & REPRESENTS THE GUIDES SECTION. THE ASHOKA CHAKRA CLARIFIES THAT THE BADGE IS THAT OF SCOUTS & GUIDES OF INDIA. IT IS THE POLE ON WHICH THE FLAG IS RAISED. IT IS THE ROPE ON WHICH THE FLAG IS TIED & RAISED TO THE TOP OF THE POLE. IT IS THE ONLY MOVABLE PART OF THE FLAG.IT HELPS THE HALYARD TO MOVE SMOOTHLY UP & DOWN THE POLE BY ROTATING ITSELF. IT IS THAT PART OF THE POLE ON WHICH THE HALYARD IS TIED. IT IS A SMALL PIECE ON THE HALYARD & IT DOES TWO THINGS. (i) IT JOINS TWO ENDS OF THE HALYARD. (ii) IT STOPS THE HALYARD FROM FURTHER ROTATION, WHEN ONE OF THE ENDS REACHES THE TOP OF THE POLE.